Keanu Reeves (47 Ronin) stars as the ultimate hitman in the action-filled revenge thriller John Wick. When sadistic young thugs senselessly attack John Wick (Reeves) – a brilliantly lethal ex-assassin – they have no idea that they’ve just awakened the boogeyman. With New York City as his bullet-riddled playground, Wick embarks on a merciless rampage, hunting down his adversaries with the skill and ruthlessness that made him an underworld legend. 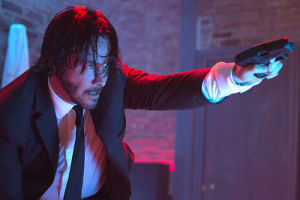 Directed by Chad Stahlelski, John Wick‘s cast also includes Michael Nyqvist (Mission Impossible: Ghost Protocol), Ian McShane (Pirates of the Caribbean: On Stranger Tides), John Leguizamo (The Lincoln Lawyer) and Willem Dafoe (The Grand Budapest Hotel). John Wick received a healthy 83% Fresh rating at Rotten Tomatoes based on 151 published reviews. The film grossed a fair $43 million upon its wide release to theaters in October, 2014.
a discussion with director Stahelski and producer David Leitch on how they made this action film their way. The Blu-ray also includes an audio commentary with the filmmakers. It is a very interesting and very funny movie.